The new federal requirement would have them list their products as having added sugars, even though they don't. Merrifield said he first heard about the issue about three years ago, but many maple producers have viewed it as something that might be coming in the future, and they’re only now waking up to the fact that the change is on their doorsteps. It’s a similar situation with beekeepers, McLaughlin said. “I think it’s probably fallen off the radar, to a large degree, from peoples’ minds,” he said. Kinney is not only aware of the issue, she is livid about it. Her business, which has 10,000 taps, produces thousands of gallons of maple syrup each year and produces more than half of her family’s annual income. 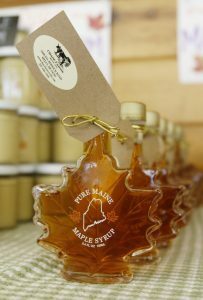 Kinney argues that maple syrup is actually a healthier source of sugar because it contains a lot of antioxidants and substances such as abscisic acid, which is thought to stimulate insulin release by the pancreas. And consumers who like to cook or bake with granulated maple sugar can cut their sugar use in half because it is so concentrated. McLaughlin, with the beekeepers association, worries that the new labeling requirement works against honey producers’ efforts to educate consumers about adulterated honey on the market that is cut with corn syrup to increase profits. “This one, I just don’t even understand the rationale,” she said. Because of the backlash, the FDA has extended the deadline for public comments until June 15. One thing everyone seems to agree on: There’s good intent behind the new added sugar nutrition guidelines, but the implementation has been less than sweet.